Houses with great wood floors can look really welcoming. 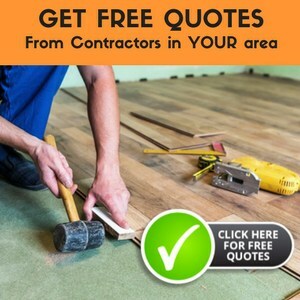 We can safely say that people are abandoning the idea of carpeted floors nowadays in favor of a nice wood floor. This is happening not only because of the cleaner, simpler look, but also because of health concerns. Carpets can be the perfect dwelling place for tons of allergens, like dust mites, pet dander, mold spores, and other noxious agents. A good wood floor is also easier to clean thoroughly. With a thick carpet, no matter how much vacuuming you do, some dust mites and other particles will inevitably still be lying under the surface. With a wood floor, on the other hand, if it has no cracks or crevices, this won’t happen because you can clean the entire surface. The best mops for wood floors can give your floor a shiny and polished look. And if you use the right cleaning product, it can even have a great, relaxing scent. But among all the solutions there, how do you choose? We’ll help you with that by reviewing three strong contenders for the title of the best mop for wood floors. In our search for the best mop for wood floors, the first product we look at is this aluminum alloy construct from Turbo Mops. This mop comes in two versions: the standard, 17-inch version, and an 11-inch apartment version. The handle is telescopic and has a range from 35 to up to 60 inches, meaning you won’t have to do much stretching to reach even the most remote places. Also, like with some of the best mops for wood floors, the mop head has a full 360° rotation range for easy cleaning in all directions. The turbo mop comes with four attachable pads: two microfiber pads and two scrubbing pads. The pads are super easy to remove and reattach, thanks to the Velcro strips on the mop head. These also do a good job keeping the pads firmly attached. The scrubbing pads work really well tearing off dirt and grime from filthy floors, but because they are a bit abrasive, caution is recommended when using them on more delicate floors. The two microfiber pads are the perfect complement to these; they attract all the dirt and give your floor a polished look. According to Turbo Mops, the fibers have a unique wedge shape in order to catch all the dust and pet hairs. Also, they can even be used as squeegees for floors with glossy finishes. And best of all, in the end, you can throw them in the washing machine! In an attempt to make the best mop for wood floors, O-Cedar built the ProMist MAX. We feel it compromises in some aspects to innovate in others. But does it pay off? First of all, the handle is not made of aluminum like the other two, just regular metal. It isn’t perfect, but it is solid nonetheless. Also, it is not telescopic, so you can’t adjust its length and will have to stretch to reach the hardest places. But then we have the advantages. This mop is called ProMist because it releases cleaning solution in front of the sweeping path. The container is easily removable and refillable, and O-Cedar even suggests using your own solution. The nozzle that releases the spray is effective and spreads the solution across a wide area, making it feel just like actual mist. The cleaning head is covered with a microfiber pad that is machine washable up to 100 times. The pad does a great job collecting dirt and absorbing moisture. But the great thing about this pad is that it flips upside down 180 degrees, meaning you can clean twice as much before removing or washing it. The downside is that in order to achieve this, O-Cedar had to reduce the head swivel. Instead of the usual 360-degree range, it only has about 45 degrees, and if you try to force it too much, you risk the head popping off. But overall, we feel the ProMist’s strengths compensate for its weaknesses, making it one of the best mops for wood floors. The final entry in our best mop for wood floors selection is the JINCLEAN 18″ Microfiber Floor Mop. Remarkably, they seem to have gathered the top features from some of the best mops for wood floors. The body of the Jinclean is made of aluminum, which feels great, and the handle is extendable. It ranges from 30 to 51 inches, which is not as good as the one from Turbo Mops, but is right up there. 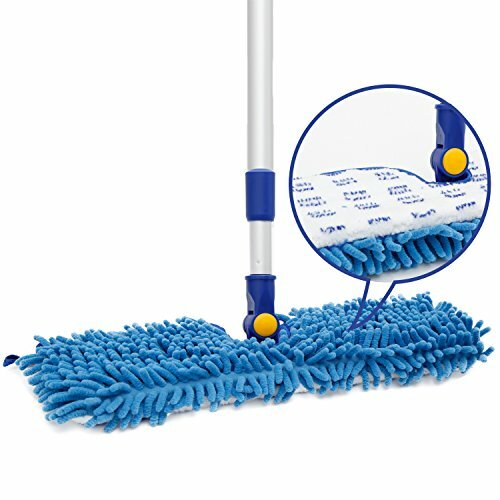 The mop head measures 18 by 6 inches, which gives it a nice cleaning area. The mop head is the best part of this mop. The pad has a dual side action. On one side, you’ve got a chenille mop, which not only has great absorbing power, but is also very efficient at picking up pet hair. On the other side, you’ve got a super-fine microfiber cloth that allows you to finish up and give your floor a nice, polished look. The great thing about this is that it flips 180 degrees to allow you to quickly switch sides, but does this while keeping the 360-degree head swivel, which is a nice surprise. With the O-Cedar, you lose some swiveling ability in order to get the 180-degree flip. Of course, the pad is also machine washable. We believe that these features certainly make the Jinclean one of the best mops for wood floors. We’ve looked at three of the best mops for wood floors, but in the end, only one can take the title. We pick the JINCLEAN 18″ Microfiber Floor Mop as the winner. It does most things right and does not have any obvious faults. 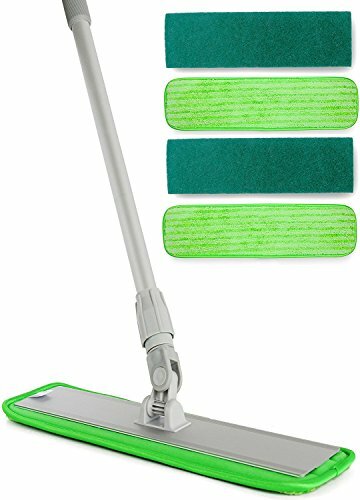 The dual microfiber mop will work wonders on your wood floors. However, its two rivals are also quality products. 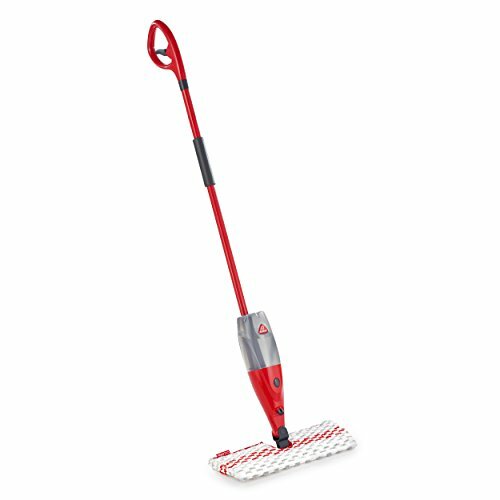 The Aluminum Alloy Microfiber Mop by Turbo Mops has scrubbing pads that come in handy but are not adequate for delicate floors, so this might not be the best mop for wood floors. The ProMist by O-Cedar has a great spraying system, but lacks some practical features like an extendable handle and swiveling head.